My music education began when I was ten years old, and I started piano lessons with a private teacher. It was typical in those days for children to have piano or violin lessons. My older brother got the violin, and for several years we proceeded in that way, and I was greatly benefitted with the experience of learning the violin repertoire through the piano accompaniments. I was also composing simple piano pieces for my own enjoyment. When I was in eighth grade, my music teacher suggested I try out for the high school of Music and Art, a new school in New York City created by Mayor LaGuardia to encourage gifted music and art students. I played an audition at the school, and happily was accepted as a student for the freshman year. After the performance exam, I was sent to the chairman of the music department, who was also the conductor of the senior orchestra. Most of the applicants were piano students, with an occasional violinist, who was ready to participate in the orchestra. Having an orchestral experience was part of the music curriculum. I was assigned the bassoon. During the freshman year all piano students were assigned an orchestral instrument. In the sophomore year they started an orchestra playing simple works that increased in difficulty as their proficiency on the secondary instrument improved. The senior orchestra consisted of the most accomplished of the students. The High School of Music and Art had 12 bassoons to be shared by 32 bassoon students, four Heckels 7,000 series, 4 Kohlerts and 4 Czech made instruments. The Heckels were the prize with the gorgeous sound. There were two challenges with the bassoon. First the reed, which had to be solved if you would ever master the instrument. You had to learn to make a proper reed if you were to have success. So I started the reed club, purchased a shaper ($3.00!) made by a machinist from a piece of brass soldered to a c-clamp. The shape was from a Knochenhauer reed, shaped one side at a time. Cane was available in gouged pieces from several dealers in NYC at 6 cents a piece. As each piece was unique in it’s own way, several pieces would be worked before you found one with a good sound, that vibrated well, and brought out the instrument’s beautiful tone quality. I was able to join the senior orchestra in my junior year. I also continued my piano studies. Make no mistake, at HSMA we had a full high school education, with all the requisite high school courses required by the board of education. I also had the pleasure of playing in many amateur groups in the city during my junior and senior years. When I graduated from HSMA I continued my studies with Simon Kovar, the remarkable teacher of many bassoon players in NYC, and at Julliard. I also attended NYU at night, studying liberal arts and literature. During the summer of 1942, after my first term at college, I was chosen to attend the Tanglewood school and music festival. It was an unusual year since it was wartime, gasoline rationing limited the attendance at Tanglewood concerts. The director and conductor, Serge Koussevitsky decided there would be no Boston Symphony concerts, but rather the Advanced Student Orchestra would perform all concerts. Among the repertoire he had chosen, was the newly composed symphony by Shostakovich, the 7th symphony, the Leningrad inspired symphony. After the Russians had repelled the Nazi army and retained Leningrad, Shostakovich had composed this piece as a memory to the siege of his city, which the Nazis lost. In this momentous work there is a lengthy bassoon passage which symbolizes a fallen Russian solder. I remember at the very first rehearsal Koussevitsky left the podium and walked back to me, placing his fingers on his chest, he instructed me to play “from the hea-a-a-a-rt.” It needed much more pathos in my interpretation. During that summer I studied double tonguing with Raymond Allard, Boston Symphony principal bassoonist. Certain technical orchestral passages became easily managed with his solution. He had a unique way of applying this rapid staccato to various passages. In January of 1943 I was drafted into the US Army. After basic training I was fortunate to get into the 70th Infantry division band. The bandmaster was always interested in performing arrangements of symphonic works and needed an oboe and bassoon player to complete the orchestration. In January 1945, the Division was shipped out to Marseilles, and participated in the last five months of the war in Europe. The band was a source of spirited music for soldiers going to the front and those soldiers going to rear recreational areas. The band was also a labor source for duties such as guard duty, KP, and whatever special needs of this rear echelon post. In April of 1945, with less than a month left of the war in Germany, it was relatively quiet where my division was stationed, so I made a trip to Biebrich to the Heckel bassoon factory. It was a half hour trip to the city of Mainz, and up the Rhine to Biebrich. As I approached the street address of Heckel, I came to a stucco wall, 8 feet high, upon which was inscribed in German “Fine Woodwind Instruments, Wilhelm Heckel.” Beyond the gate was a courtyard with a statue of an angel playing the bassoon in a water fountain, water missing. The Heckel bassoon factory was a plain two story building. I knocked on the door and a short stout man came out. In my poor German I identified myself as a student of Herr Kovar in NYC. The man responded in English, “Well, I’ll be bopped on the head.” With those English words I knew we would be able to converse. We had a wonderful visit. After several hours I left carrying a brand new Heckel #9035. 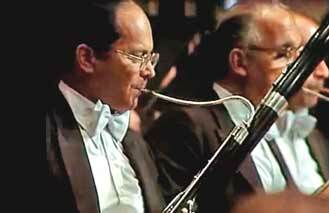 I used that instrument for many years until I acquired a superb series 7,000 Heckel from Ben Kohon, my friend who was the outstanding principal bassoonist of the NY Philharmonic. With tens of thousands of American soldiers waiting for ships to take them home, I decided to accept a one term attendance at the Guildhall School of Music in London, which was made available to American soldiers. I also took the final exam at the Royal College of Music, and was awarded the Associate diploma. When I returned to NYC, my home, I continued my college education. I graduated from NYU with a BA in English literature, and continued at Columbia University with a masters in composition. My teachers there were Otto Leuning and Henry Cowell, and privately with Hugo Kauder. The requirement for graduation was to compose a symphony. I appealed to Professor Leuning to allow me to compose a quartet for bassoon and string trio. It as a fine combination, and I hoped to perform it in my career as a bassoonist. That worked out nicely. During my college years I performed with various community orchestras that needed a bassoonist. I also played with the Little Orchestra Society of New York, with Thomas Scherman, conducting, 1949-1957, and the New York City Ballet Orchestra, Leon Barzin, conducting, from 1950-1957. During this time I made many recordings with different groups, and solo radio broadcasts. One thing I wanted to do when I got back from the war, was to organize a woodwind quintet with my friends, and once again enjoy that fine combination. The New York Woodwind Quintet gave its first concert in the Museum of the City of New York. The membership of the quintet changed quit a bit as players took positions with orchestras and had to be replaced. The group stablized in 1949 with Sam Baron on flute, Jerry Roth, oboe, David Glazer, clarinet, John Barrows, horn and myself on bassoon. That continued until 1957 when I joined the Philadelphia Orchestra. I remained with the orchestra until 2000 when I retired. I joined the Philadelphia Woodwind Quintet when my predecessor Sol Schoenbach retired. During that time with the orchestra, I taught at Temple University for 43 years, and at the Curtis Institute for 32 years. After I left the orchestra, I returned actively to composing. Among the things I wanted to do, was to compose a book of concert etudes, having enjoyed playing the 50 studies by Milde. With my book of 31 etudes, I had in mind the further development of the extreme register of the bassoon. The language of my music is a combination of years of orchestral playing, plus the piano works I studied in my youth, and endless hours of accompanying my brother, a gifted violinist. If I were to use words to describe my compositions, they would be expressive and melodic.